We have decided to become a one-car family! If you remember, three weeks ago my car wouldn’t start and we found out it needed $1,600 in repairs. We paid $400 to get it running and evaluated the possibility of relying completely on Kyle’s car until we start working at different places. (We don’t want to sell the car because it still has a lot of miles left in it. Kyle will graduate in a year-ish and will likely move on to another institution, at which time we’ll probably need two cars again.) We carpooled everywhere for three weeks and looked into all of the implications of no longer driving the car. In this post I’ll share our thoughts on this process. We own two sedans and have two parking permits for work. There is plenty of parking at our apartment complex. We carry a lot of car insurance. Although we work in the same place, we usually drive separately because of 1) our shifted sleep schedules (Kyle typically goes to work 1-2 hours later than I do) and 2) our differing after-work activities. However, in the last few months our activities have shifted up a bit so that a window opened for us to be able to share one car. In the process of this examination of my car, I realized that my registration expired quite a while and I haven’t paid property taxes in two years. It seems that in the process of changing my name and moving to Kyle’s apartment, the DMV registration department didn’t get my updated address, so I hadn’t received any mail from them and apparently without that prompting I’m not a responsible adult. (Note for newlyweds, at least in NC: Just because you change your name and address on your license does not mean that it is changed on your registration! You have to contact both departments.) I’ve been driving around with expired registration for several months but thankfully I was never pulled over! So I was dreading calling the DMV – I figured they would yell at me and hit me with back taxes and fines. 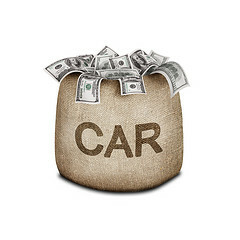 We wanted to predict the amount of money we would save by not driving my car as well as evaluate the intangible implications of letting it sit for a year and relying on only one car. According to the representative, I won’t have to pay back property taxes. When I re-register the car they will apparently just charge me for the previous 1 year! When we’re ready to re-register the car, we can apparently get temporary tags from the DMV to put on the car while we’re getting it repaired, inspected, and registered. Sounds easy! Basically, by not registering the car this year we will save paying all those fees once since they will just repeat next year (except the new plates). We paid up front for our two yearly parking permits, but now we’ll only be using one. Because we don’t want to lose our spots in the parking permit hierarchy (it took us 3 years to get where we are!) we want to rent out our permit, not sell it back to the parking office. We shouldn’t have any trouble finding a first-year to take it off our hands because some of their permits are just terrible! When the permit is up for renewal in August, we can either decide to continue the rental situation or just renew one of them (Kyle’s anticipated graduation date as well as how well the one-car situation is working out will affect this call). One permit costs $274 per year. It’s hard to tell how much we’ll save on gas by only using Kyle’s car. Right now Kyle usually spends about $80/month and I spend $40/month on gas, so our savings would be between $0 and $40. I’ll estimate $20/month for now. 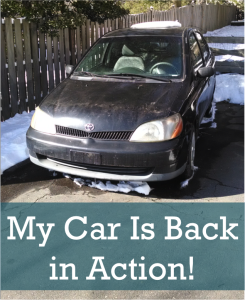 What if Kyle’s car needs repairs – how will we get around? I used Google Transit to look up the bus route from our home to campus. I’m glad I used Google Transit because there are about 6 different bus systems in our metropolitan area. It turns out that there is a bus that will take us directly from a shopping center near our apartment to the edge of campus – an 11 minute ride plus walking time. Even better, our university provides us with free bus passes! If we needed to go somewhere off the bus routes, we could always use WeCar (Zipcar, available on campus), catch a cab, or rent a car. Can we keep the car at our apartment complex with expired registration? At first, we were concerned that we would have to turn in our plates (that’s what other states do and what our insurance agent told us) but according to the DMV we don’t need to. Our lease states that cars must have up-to-date plates and inspections or they may be towed. Since the car has already been there for several months with no issues, we plan to just maintain the status quo. Our apartment complex doesn’t seem to care much about the presence of non-functional cars because we have seen one or two around the complex, staying in exactly the same spot for months. What will happen to the car if it sits for the year? The internet didn’t give me a definitive answer on this, but the general consensus was that the car should be turned on somewhere between once every few days and once per month. I think once per week we will repark it. How did the carpooling go these last three weeks? GREAT! The first few mornings took some adjusting, but we’ve had many fewer conflicts than I expected. We’ve generally arrived at work between 9:00 and 10:30 AM, which works well for both of us. I stayed at home during Kyle’s small group and band practice, I went to the gym twice during his basketball games, and we did errands together. We hit a couple snags where we had conflicting needs for the car, but we were able to work them out easily, only having to burn a little bit of time and ask for a ride from a friend once. I love spending the additional time with Kyle and being forced to coordinate our schedules more. That’s it! Those are all the issues we considered. Sharing a car really is only a slight inconvenience, and we have a back-up plan in case we have to temporarily have zero cars. In all, we expect to save in the neighborhood of $972.03 per year by not driving the car. Since the remaining repairs will cost $1200 all of those savings need to go toward them, but we will be able to drop the savings rate to our Cars account from what we set it to be for this month (a $120 increase down to about $20/month above what we saved before). I think nearly a grand a year is worth the very slight inconveniences we’ve experienced! How much would you save if you went down to one car? Have you ever let a car registration lapse? 34 Responses to "The Financial Implications of Dropping One Car"
Wow you were very thorough about this to make sure that it would work out for both of you with only one car! I’m actually surprised that dealing with the DMV was that easy, but it sounds like they were very helpful in your case! This is the level of detailed research that Kyle requires before making big decisions! I actually have had some pretty positive experiences with the NC DMVs. I am keeping in the back of my mind that my friends were fined though so I’m not shocked if they hit me with one when I try to re-register. That’s good money! I think that if we went one car only, we’d save upward of $5000 per year (my insurance is insanely high). Unfortunately it’s not an option while I’m in school. I was actually surprised it was less than $1,000/year. Cars are supposed to be sooooo expensive, but there are economies of scale, apparently. Obviously maintaining the primary car is much more than $1,000/year. Of course that $1,000 doesn’t take into account maintenance and repairs that we would have during the course of the year, so really it’s more like $2,200 or so if we kept driving it. I’d love to go down to one car, but for us it just isn’t feasible! I’m sure we’d save somewhere around $1000-2000/year if we did though! As a sidenote: if Kyle’s car breaks down you’re all over the options! I see a lot of people let this fear cripple them. There are options if a car breaks down. They may not be convenient but it’s still doable. I’m so glad we were forced to explore the feasibility in our case. We thought about it when we got married but probably wouldn’t have revisited the idea without my car troubles. I think the bus backup option is made a lot easier because we are working at a university – which also happens to be the largest single employer in our city! A lot of people need to get to campus and parking is quite crowded, so there are lots of initiatives to get students and employees to use alternate transportation. By taking the bus our commute would go from about 15-20 minutes each way to 30-35 minutes each way – not bad! Good post Emily! We only share one vehicle and I noticed that many of our neighbours do as well. You have a question about your car sitting for a year. I can only speak from experience, but we left our Saturn MiniVan sit for 6 months and the moisture rusted the brakes and we ended up needing new ones. By driving the vehicle at least a few times a month, you remove any build up on the brakes, but by just living it sit, it starts to rust. My nephew had the exact same problem. He parked his car on my brother’s drive way for 3 months while he was out of the country for school and my brother didn’t think to drive it a bit. When he came back and went to drive his car the brakes were squealing as well. Just something to think about. OK I will definitely be sure to move it around a bit regularly. I don’t want to add to our repair bill! Beautiful analysis. I think your figures are accurate. My 2002 Hyundai Elantra has a problem which requires $2000 to fix and the KBB is only $2800 We are thinking about the plan of action now. Thanks! Yeah, I’m not sure how to judge those end-of-life scenarios yet. I think we’re still a few years away from that with my Toyota, although my husband pegs it closer than I do. I guess it also depends how able you are to obtain another car at the time. Oh, I would LOVE to live car-free if I could, or only use our car on the weekends. My first year after college I lived in the DC area and Metroed to work and everywhere else. Even better, my Metro trips were subsidized by work so I essentially had zero transportation costs. Unfortunately public transportation isn’t so hot here in NC. My husband loves driving though – the freedom of it, or whatever. I’m satisfied with letting him drive everywhere and only getting behind the wheel for my solo errands. However, I do live next to our grocery store and a few restaurants so aside from work, we get to walk to most everything else and it is really awesome. Sometimes an urban life sounds enticing. I can definitely imagine that with kids needing to be various places using only one car would be a huge timesuck/impossible! Maybe again in the future. Great research – and great savings! Glad you guys decided to try it first and that it worked out! Me too! It’s going really well. I love spending the additional time together.